The Adventures of Captain Africa (1955): S'okay. No great shakes. 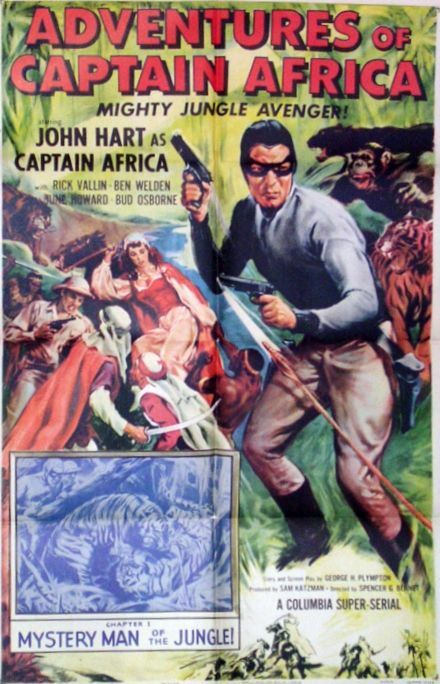 This was originally meant to be a sequel to the 1943 serial, "The Phantom", based upon the popular jungle superhero from comics. However, Columbia's rights for making another "Phantom" movie had long since expired. Legendary Hollywood cheapskate, producer Sam Katzman, refused to buy the rights to "The Phantom" so a similar, "original" character was created instead. That, in itself, is not necessarily a bad deal, but the entire serial was made on the cheap. The bulk of the serial is stock footage taken from three serials: "Jungle Menace" (1937), "The Phantom" (1943), "The Desert Hawk" (1944). Only a few minutes of original footage was shot for each chapter. Many serials would feature a re-cap chapter, that covered earlier events in the serial. This serial was unusual, since it had 4 re-cap chapters (also referred to as "cheaters"). It's believed that one reason for this was due to the hasty rewrites during production. The fact that this serial is called "Captain Africa" is a misnomer. Although John Hart (Captain Africa) is given top billing, Captain Africa is really a character of third importance at best. The primary hero is Ted Arnold (played by Rick Vallin) and his sidekick Nat Coleman (played by Bud Osborne) comes in second. There are some chapters where we barely see Captain Africa. It's safe to say that he is a minor character in his own film. But he's the only one who really brings out any action so it's good that he's "plunked" in there. Captain Africa is made to look and act like The Phantom. I think it's kind of sucky that a character called Captain Africa isn't...oh, I don't know...African! This is just a sign of how totally stupid Hollywood can be sometimes. Why shouldn't a man named Captain Africa be black? Then again, the whole African locale doesn't seem too genuine. There's an awful lot of Arabs and desert for a jungle setting. Never have figured out why there aren't black people in an African story. Even the "natives" look more like Indians. This mighty jungle lord apparently has no strong love for his animal brethren. The number of animal deaths in this serial is something else. Another weird thing about this serial: the main villain appears NOWHERE in this film. The characters talk about him, but they never show him. We just know that he deposed the good ruler, Abdul el Hamid. On the whole, this movie is an incoherent bore. It's just not put together right. I suppose parts of it make interesting visuals, but that's about it. John Hart does some pretty good action work. 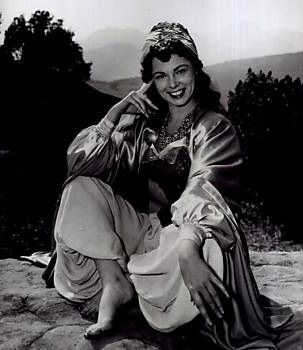 June Howard is pretty as Princess Rhoda. Some critics take a potshot at the acting of the entire cast. I don't think anyone was necessarily a bad actor in this serial, I just don't think they had much to work with. "The Adventures of Captain Africa" is not a must-see, but if you come across it in your travels, you'll find certain highlights. Chapters: Those in boldface are the more interesting, must-see chapters of this serial. Captain Africa kills one leopard. We don't see much of Captain Africa in this chapter. Captain Africa kills four men and one mule in this chapter. That makes a total of 6 he's killed so far in this serial. Balu, a native, kills a lion to save Captain Africa. This is one of the more interesting chapters in the serial. Captain Africa doesn't kill anyone in this chapter, although we do see quite a bit of him. We see that Captain Africa has some kind of mystical power in the crystal ball scene. A lot of this serial is recap, using flashback sequences we've seen only a few chapters back. Captain Africa doesn't kill anyone in this chapter, even though he's in it quite a bit from the beginning. This is one of the better chapters in the serial for all the interesting action sequences. Captain Africa falls into and gets himself out of quicksand. Captain Africa then appears in a cloud of smoke at his jungle throne, and disappears the same way. A big Arab battle takes place (Captain Africa not present). Princess Rhoda is kidnapped on coach. Captain Africa doesn't appear very much in this chapter. Love begins to bloom between Ted Arnold (Rick Vallin) and Princess Rhoda (June Howard). Not only was this Columbia's last jungle serial, it was the third to last serial they ever produced! Debuted on June 9, 1955 in the US. The movie rights to "The Phantom" were a bit too expensive for Sam Katzman's tastes, so the negotiations broke down. This was the last work of June Howard, who has only one other credit to her name, a 1955 episode of the TV series "Hallmark Hall of Fame".